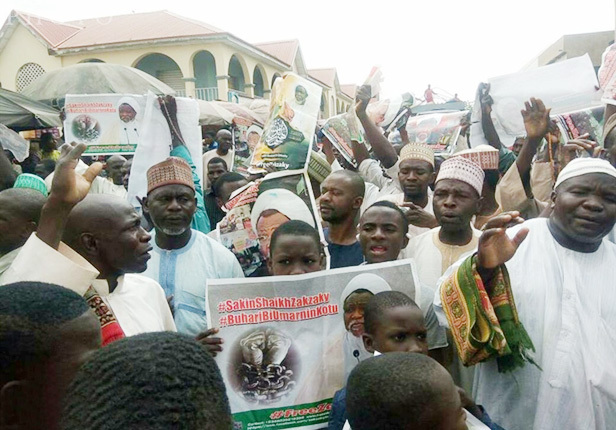 The Islamic Movement of Nigeria has asked President Muhammadu Buhari to release its leader, Sheikh Ibraheem Zakzaky, his wife, Zeenah, and several hundreds of other members from detention. A statement by its media director, Ibrahim Musa on Sunday, said it was becoming clearer to people that right from the outset; the intent was to destroy the group. The statement said, “It is now 700 days since the unwarranted detention of our leader, Sheikh Ibraheem Zakzaky, his wife, Zeenah, and several hundreds of other members of the Islamic Movement in Nigeria in various detention centres. That was sequel to the cruel attack by the Federal government using its Military might in an attempt at exterminating the Movement, its leadership, membership and properties. As we are all aware, since that murderous weekend of December 12, 2015, we are still looking for justice on the matter. “What happened between December 12 and 14, 2015 and subsequently has largely been deliberately kept hidden by the perpetrators. Amnesty International (AI) in its report called it “’Unearthing the Truth’: Unlawful killings and mass cover-up in Zaria.” The report, which was a product of extensive field investigation by independent investigators, has since been irritating the Nigerian government, who are hell-bent on covering what actually happened that cost the lives of over a thousand innocent citizens, using all instruments of state powers. “Only recently, they have tried unsuccessfully to stamp the cover up using the so-called Presidential Investigation Panel, headed by Justice Biobele A. Georgewill, purportedly established to probe human rights abuses of the military. However, when it mattered most, the panel clearly demonstrated its lack of credibility and independence, when it took weeks before the panel was given “permission” to entertain the memo of the most victimised petitioner, who suffered what could best be described as state-sanctioned genocide. Even at that, the panel did not have the liver to take testimony in public, as it tried to hide evidence from public glare and scrutiny. The government of Buhari was not prepared to face the truth. “It is only now that it is becoming clear to people that right from the outset; the intent was to destroy in whole the Islamic Movement in Nigeria (IMN). That was clearly demonstrated by the military personnel that repeatedly chanted “No more Shia” and other anti-IMN slogans as they massacred women, children and all others in Zaria. That would explain why they destroyed all properties of IMN including schools and religious centres as well as desecrated grave yards where members of IMN were buried. They massively killed over a thousand members of the IMN, including those they had shot and injured but could not be taken to shelter. They burnt people alive as well as the corpses of those they had killed! “Who would quantify the serious bodily or mental harm the unprecedented Zaria massacre and the persistent follow through had caused to members of the Islamic Movement and their relations? Those who had escaped with their lives faced other shades of brutality till this day. Hundreds were arbitrarily arrested and are detained, some being wrongly accused with framed up charges. It is only now that the courts have been vindicating us, discharging and acquitting the wrongfully accused and detained. Many are still being kept in secret confinement without charges or trials. “Many were denied appropriate medical attention and died in custody. Pregnant women had premature deliveries while in custody and some others suffered miscarriages. The hallmark of the mental torture was the secret burial of those they killed in mass graves without letting their relations give them a befitting burial. In fact, their relatives have not been informed of the extrajudicial execution of their loved ones. “Shaikh Zakzaky’s health condition continues to deteriorate in detention, a condition calculated to bring about his physical destruction. Even as the courts had passed judgement calling for the release of the Sheikh and compensation for illegal detention, the government is still holding him in contempt to that judgement almost a year after. For the last seven hundred days of their incarceration, Sheikh Zakzaky was allowed access to his lawyers only twice. “For the last seven hundred days, we are being denied our rights to our faith in Kaduna, Kano and Sokoto as well as some few other states. We have been denied the right to freely associate, assemble or peacefully protest. You all are witnesses to all these acts of intimidation. “As of today, the government of Buhari has not arrested a single person for these serious crimes. It has shown obvious unwillingness to appropriately prosecute the perpetrators of this genocide. It only seeks to further protect them and even further perpetrate more crimes. We are prepared to take all necessary legal ways to seek redress. In the international scene, we shall proceed to urge the Prosecutor at the International Criminal Court (ICC) at The Hague to indict President Muhammadu Buhari, Governors Nasiru ElRufai and Umaru Ganduje, General Yusuf Buratai and all others who meticulously planned and executed the Zaria genocide and are actively perpetuating it.